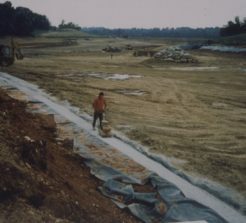 LLDPE was chosen because of the shallow nature of this area of the lake and because the liner was required to go under the footing and behind the segmental block wall. Jen-Hill uses LLDPE liners when flexibility is one of the main concerns. LLDPE maintains the strength of polyethylene and is able to elongate under stress. It is a good shallow-water geomembrane, is resistant to UV, fish safe and potable water safe.